Valentines day is just around the corner. Me personally I am not big on this holiday, for some reason. Maybe its because my birthday is a few days before, or just because I've always been single on this suppose to be romantic day. Just saying. I'm not expecting anything special this year, but I have been seeing some cute decoration ideas being blogged. I want to share this one that I found as I was blog stalking. I think this is an extremely cute craft and will be doing this for the fun of it. Begin with a 12-by-16-inch sheet of waxed paper. Fold it in half along its length; unfold. Deposit wax-crayon shavings (made with a handheld pencil sharpener) evenly but not thickly across one half of the paper. Fold the clean half of the paper over the shavings. Crimp the three open edges with a 1/2-inch fold to hold the shavings. Protect your ironing surface with kraft paper. Place the waxed paper on the kraft paper, and cover it with another sheet of kraft paper. Iron lightly on medium heat, checking after every few passes. Stop when all the shavings have melted; let cool. 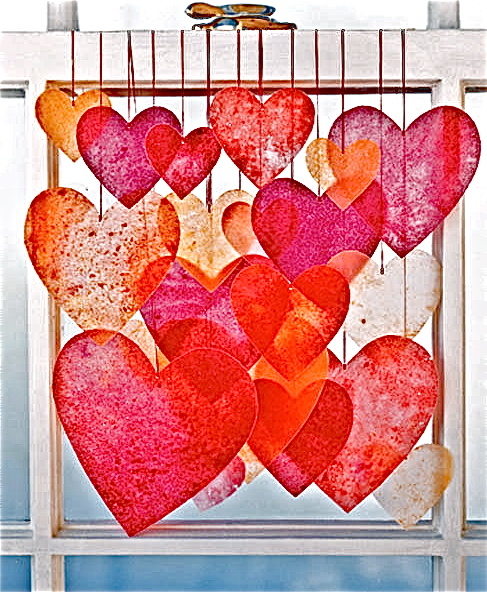 Next, trace and cut out hearts of various sizes. String each heart with a silk thread for hanging.